Health care was a top issue for 52 percent of voters, and they broke hard toward the Democrat. Conor Lamb beat Rick Saccone in a stunning upset in the Pennsylvania 18th congressional district’s special election on Tuesday night — and, in an equally striking result, health care beat tax cuts. This race was decided by less than 1,000 votes, so any number of issues could have been decisive. But health care can make a compelling case that it put Lamb over the top. Health care was a top issue for 52 percent of voters: 15 percent said it was the most important issue for them and another 37 percent said that it was very important. The health care voters broke hard toward Lamb: 64 percent of those who said it was their No. 1 issue backed the Democrat, and 62 percent of the people who said it was very important supported him. Obamacare broke even in a district that Donald Trump won by 20 percentage points in 2016: 44 percent of voters supported the law, and 42 percent opposed it. Meanwhile, 52 percent of PA-18 voters said they opposed the Republican plans to repeal the health care law, and only 39 percent approved. The Affordable Care Act has flaws, but it has provided affordable coverage to more than a million Pennsylvanians who were previously uninsured. Our representatives in Congress should be working together to build on that progress, fix what isn’t working, and make the law better. Instead, Republicans in Congress spent the past year trying to take health insurance away from people with no plan to replace it. Now, costs are likely to go up for many of us, especially those with preexisting conditions. That is unacceptable, and it’s a failure of leadership. Republican leaders have not even allowed a vote on a bipartisan, common-sense effort to strengthen the ACA and stabilize the markets. In my conversations over the last few months, Democratic operatives have made it clear they think health care can be a winner for them. Preexisting conditions, in particular, have proven to be a potent message, as well as the mainstays like Medicare. You can also bet that they will make a lot of hay out of any premium spikes we see in the fall, given that experts placed the blame squarely on Trump for the bulk of last year’s increases. If PA-18 was a test run, it seems like a Democratic message of “Republicans tried to take away your health care, hiked your premiums, and endangered protections for preexisting conditions” can work even in a solid-red district. The GOP’s counterpunch was supposed to be their tax bill, the signature achievement of the 115th Congress. A month ago, as my colleague Tara Golshan documented, two-thirds of the pro-Saccone TV ads were touting the tax plan. But they didn’t break through, and Lamb continued to climb in the polls. Saccone was leading by 12 points back in early January; by the beginning of March, Lamb was pulling into the lead. The tax bill is getting more popular, according to the polling. But it’s still roughly a wash with the public, and it doesn’t appear to have the same power to get people to the voting booth that health care does. It’s not at all clear that Republicans have an alternative plan. The last-ditch pro-Saccone ads shifted the terrain to immigration, but that doesn’t seem to have worked (and let’s remember the Virginia governor’s race, where the Republican candidate went all-in on a Trump-style attack over immigration and lost in a historic landslide). We’re still a long way from Election Day, of course. But the policy debate, non-Trump division, is shaping up to be health care versus tax cuts. Right now, you’d rather be running on the former. Conor Lamb, a Democrat and former Marine, scored a razor-thin but extraordinary upset in a special House election in southwestern Pennsylvania after a few thousand absentee ballots cemented a Democratic victory in the heart of President Trump’s Rust Belt base. The battle for a district in suburban and rural areas around Pittsburgh underscored the degree to which Mr. Trump’s appeal has receded across the country. And it exposed the ways in which both parties are weighed down by divisive leaders: Democrats by Nancy Pelosi, the House minority leader; Republicans by Mr. Trump and Paul D. Ryan, the speaker of the House. Just as vividly, the race showed that only one party — the Democrats — appears willing to grapple with the implications of campaigning under its unpopular figurehead. In Pennsylvania, Mr. Lamb, a 33-year-old former prosecutor from a local Democratic dynasty, presented himself as independent-minded and neighborly, vowing early that he would not support Ms. Pelosi to lead House Democrats and playing down his connections to his national party. He echoed traditional Democratic themes about union rights and economic fairness, but took a more conservative position on the hot-button issue of guns. Throughout the race, Mr. Lamb said he welcomed support from people who voted for Mr. Trump, and he saved his most blunt criticism for Mr. Ryan, highlighting the speaker’s ambitions to overhaul Social Security and Medicare. Mr. Lamb’s approach could become a template for a cluster of more moderate Democrats contesting conservative-leaning seats, in states like Arkansas, Kansas and Utah. Democrats in Washington have focused chiefly on Republican-held seats in the upscale suburbs where Mr. Trump is most intensely disliked. But they are hungry for gains across the political map, and in red areas they have encouraged candidates to put local imperatives above fealty to the national party, even tolerating outright disavowals of Ms. Pelosi. Representative Cheri Bustos of Illinois, a Democrat who represents a farm and manufacturing district Mr. Trump narrowly carried, said the party’s recruits should feel free to oppose Ms. Pelosi if they choose. She noted that she was helping one such anti-Pelosi candidate, Paul Davis of Kansas, who was in Washington this week raising money. Representative Mike Doyle of Pennsylvania, a veteran Democrat from a neighboring district, said Mr. Lamb had benefited from “buyer’s remorse” among Trump supporters and had wisely tailored his message to the conservative-leaning area. “This guy has made a lot of promises that aren’t being kept,” Mr. Doyle said of the president. On the Republican side, Mr. Saccone, 60, campaigned chiefly as a stand-in for Mr. Trump, endorsing the president’s agenda from top to bottom. He campaigned extensively with Mr. Trump and members of his administration and relied heavily on campaign spending from outside Republican groups that attempted to make Ms. Pelosi a central voting issue. Conservative outside groups also sought to promote the tax cuts recently enacted by the party, but found that message had little effect. Yet the Republicans’ all-hands rescue mission was not enough to salvage Mr. Saccone’s candidacy. Mr. Saccone has not conceded and Republicans have indicated they may challenge the results through litigation, a long-shot strategy. In a meeting with House Republicans on Wednesday morning, Representative Steve Stivers of Ohio, who leads the party’s campaign committee, described the race as “too close to call,” according to a person who heard his presentation. But Mr. Ryan and Mr. Stivers also called the election a “wake-up call” for Republican lawmakers, telling them that they could not afford to fall behind on fund-raising, as Mr. Saccone did. Mr. Lamb raised $3.9 million and spent $3 million, compared with Mr. Saccone’s $900,000 raised and $600,000 spent as of Feb. 21. But Republican outside groups swamped the district. Between conservative “super PACs” and the National Republican Congressional Committee, Mr. Saccone had more than $14 million spent on his behalf. Mr. Lamb got just over $2 million. As Republican lawmakers spilled out of their morning conference meeting, few seemed willing to come to grips with how much Mr. Trump is energizing Democrats and turning off independent voters. Some of them even argued that Mr. Saccone had managed to make the race close only thanks to the president’s rally in the district on Saturday. “The president came in and helped close this race and got it to where it is right now,” said Mr. Ryan. Others in the conference, however, talked more openly about the political difficulties of breaking with Mr. Trump. “There is no benefit from running away from the president,” said Representative Patrick T. McHenry of North Carolina, a member of his party’s leadership, noting that Republican candidates need core conservative voters, a constituency that still backs the president, to show up. “It doesn’t get them the same thing as Lamb opposing Pelosi,” Mr. McHenry said. Even Mr. Stivers, who has the task of re-electing a contingent of lawmakers from districts that backed Hillary Clinton, declined to say Republicans should feel free to break from Mr. Trump. “I am not going to tell anybody to be against the president,” he said. But turnout levels in the district’s suburban precincts proved crucial for Mr. Lamb, and a handful of Republican House veterans conceded this broader vulnerability. But he argued that Mr. Trump’s unpopularity in high-income areas would be less of a drag on incumbents who had their own identity and were steeled for difficult races. Yet even as most Republicans pinned the blame on Mr. Saccone’s fund-raising weakness or held up Mr. Lamb’s willingness to oppose Ms. Pelosi, refusing to fault Mr. Trump, one retiring lawmaker was more blunt. Democrats were buoyant at Mr. Lamb’s victory, viewing his upset as both a harbinger of a November wave and perhaps a sign that the party had overcome some of the most stinging Republican attack lines of the Obama years. Polling in both parties found Ms. Pelosi widely disliked among voters in the district, but the Republican ads featuring her apparently failed to disqualify Mr. Lamb. Mayor Bill Peduto of Pittsburgh, a Democrat, said Mr. Lamb’s campaign showed that the Republicans’ anti-Pelosi playbook had limitations. The race, he said, should embolden Democrats to contest difficult districts in the Midwest with an economic message that appeals to elements of Mr. Trump’s base. Mr. Peduto urged the Democratic Congressional Campaign Committee, the electioneering vehicle for House Democrats, to expand its target list in the Trump-aligned Midwest. To the extent that Democrats attempt further incursions into Trump country, it may test their party’s willingness to tolerate Lamb-like deviation on matters like gun control, and perhaps more widespread rejection of Ms. Pelosi. Democrats in Washington have already faced criticism from liberal activists for intervening in primary elections, in states like Texas and California, to promote candidates that they view as more electable. Putting forward a slate of moderates in Republican areas could prove more controversial than boosting just one in a special election. Up to this point, however, Democratic leaders and their campaign tacticians have taken a just-win approach, encouraging candidates to attack Mr. Ryan but taking a far more permissive view of party loyalty than their Republican counterparts. Clarke Tucker, a Democratic state legislator in Arkansas who is challenging Representative French Hill, a Republican, said on Wednesday that he took Mr. Lamb’s victory as a validation of a throw-the-bums-out message he planned to deliver in his own race. Campaigning in a seat that includes Little Rock and its suburbs, Mr. Tucker said he seldom spoke about Mr. Trump and announced up front that he would not back Ms. Pelosi. Mr. Tucker, who was aggressively recruited by the D.C.C.C., said that he had told Democrats in Washington that he was “very frustrated with the leadership of the House in both parties” and that no one attempted to dissuade him from delivering that message. 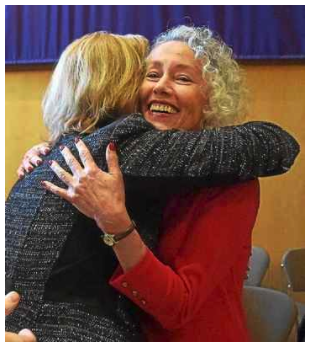 It was a different kind of “#MeToo” moment on display Wednesday as four women, all Democrats, were sworn in as new Chester County row officers at ceremonies held at West Chester University and witnessed by a packed hall of well-wishers, other elected officials, and county staff. The presence of female officials on the stage did not pass notice by county commissioners’ Chairwoman Michelle Kichline, who shared officiating duties with commissioners’ Vice Chairwoman Kathi Cozzone as county President Judge Jacqueline Carroll Cody administered several of the oaths of office. “Chester County government, unlike our state and federal governments, has a long history of electing women to leadership positions,” said Kichline, the Republican who announced earlier that her fellow commissioners, Democrat Cozzone included, had agreed to keep her in place as head of the three-member board for another year. “In fact, one could argue that having so many women at the helm has strongly contributed to our position as the healthiest, the wealthiest, and the best educated county in the state,” Kichline said, offering parenthetical apologies to Commissioner Terence Farrell, seated a few feet away and smiling at the joke. The four women who were sworn in — Patricia Maisano, Margaret Reif, Yolanda Van De Krol, and Dr. Christina Vandepol — will all play a role in the continuation of those benefits, suggested Cozzone in her remarks. She remarked on the largely harmonious nature of county government in West Chester, unlike the other county seats in southeastern Pennsylvania. Farrell, in his address to those in the hall, said that even though the county had its share of wealth and prosperity, the real job of government was to pay attention to those who don’t. As the new Democratic row officers looked on, Farrell reminded them that taxpayer dollars go to “support our most vulnerable citizens. The commissioners’ comments represented a break from past tradition at the swearing-in event that takes place every two years. In previous years, the role of master of ceremonies has been handled by the head of the Chester County Republican Committee. But with the presence now of Democrats in county leadership positions, that designation was abandoned. The Democratic row officers — Maisano as treasurer, Reif as controller, Van De Krol as clerk of courts, and Vandepol as coroner — scored history victories in November, becoming the first of their party to win countywide elections outside of the minority commissioners’ office, which is mandated by county code. Their victory was momentous not only because of its “first-ever” status, but because of its size and the status of the Republicans who went down to defeat winning their races by an average of 7 percent. Two years prior, in 2015, Democrats running for county office lost their races by an average of 17 percent. Maisano, running for treasurer, outpolled Republican Jack London 57,318 votes to 49,453. Controller candidate Reif bested incumbent Republican Norman MacQueen 57,455 votes to 47,824. Van De Krol, who entered the race in mid-summer, was victorious over Clerk of Courts Robin Marcello, with 56,195 votes to incumbent Robin Marcello’s 50,199. And finally, coroner candidate Dr. Christina Vandepol won the race over incumbent Dr. Gordon Eck, 57,584 to 48,866. Reif, 49, of Uwchlan has a degree in economics and finance and is controller for Youth Mentoring Project, a Malvern-based nonprofit organization. She previously worked as an investment liaison at Vanguard, and helps run a family business, Level Best Carpentry. Van De Krol, 56, of Tredyffrin is a 20-year veteran of the financial services industry, including two years as vice president for Citizens Bank before her retirement this year. She served as president of the Tredyffrin Library Board, and previously ran for supervisor in that township. VandePol, 69, of West Whiteland is a graduate of the University of Pennsylvania Medical School, and worked in medicine and research in a variety of positions. She currently teaches Human Anatomy and Physiology at Delaware Community College. Maisano, 66, of Kennett, is the founder and chief executive officer of IKOR International, a company providing patient advocacy and professional guardianship services to the disabled and seniors. None of the women made remarks at the swearing-in ceremony. Reif, Van De Krol, and Vandepol attended the commissioners’ reorganization meeting earlier, and participated in approving the staff positions for their offices for 2018. All four began work Tuesday at the county’s Justice Center, administrative offices, and Government Services Center. Also sworn in were new magisterial district justices Bret Binder of West Chester, Al Iacocca of Kennett Square, and John Hipple of North Coventry. Cozzone, in her remarks about how to work together as a team despite the difference in political leanings, quoted her former aide, Adam Swope, who died in an automobile crash a few days after the November election.